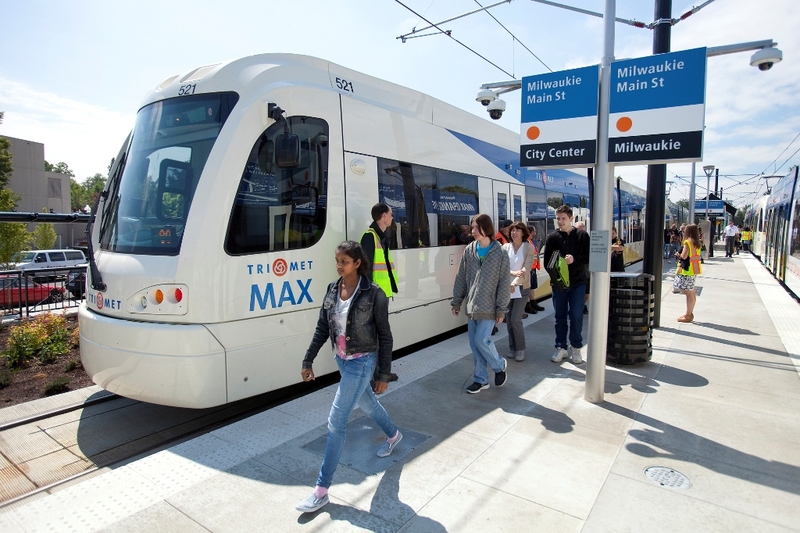 Milwaukie High students get an advanced ride on the future MAX Orange Line as part of TriMet’s School Safety Rides, sponsored by OHSU Doernbecher Children’s Hospital. Some 3,300 students at 17 schools located near the MAX Orange Line will be given safety training on how to be safe and alert about approaching trains. TriMet is teaming up with OHSU Doernbecher Children’s Hospital Tom Sargent Safety Center to educate thousands of Portland and Milwaukie students on how to be safe around the MAX Orange Line, which begins service between downtown Portland, Milwaukie and north Clackamas County on Saturday, September 12. 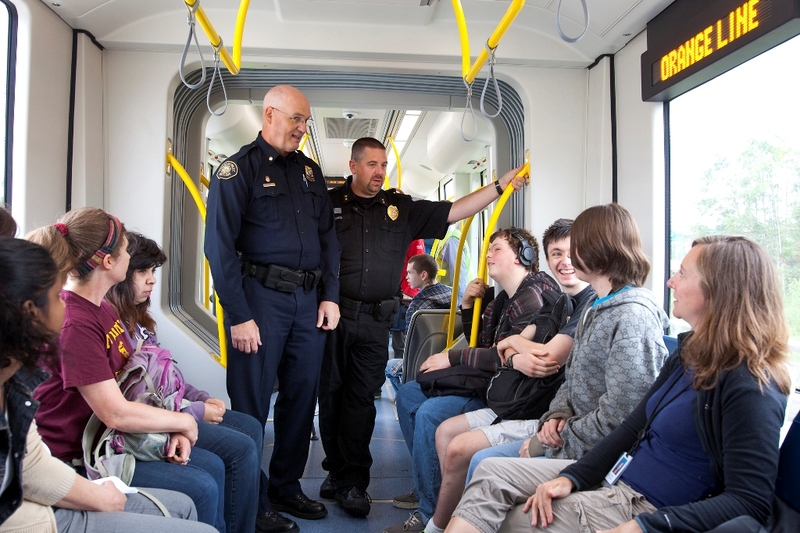 Transit Police Commander Mike Leloff (left) and Milwaukie Police Chief Steve Bartol (right) talk with students about the MAX Orange Line and safe behavior around trains. On Wednesday, May 27, the first of about 1,400 Milwaukie area students stepped on board MAX trains and rode along the new alignment to the South Waterfront/SW Moody Ave Station. There, Doernbecher staff gave presentations about how to be safe around the trains. TriMet’s Transit Police Commander Mike Leloff and Milwaukie Police Chief Steve Bartol accompanied students on the ride and stressed being alert and aware around the trains. Along with the ride and safety lessons, students also receive written transit safety education materials both in the class and during the ride. The materials are in English and Spanish. To stay safe around MAX trains, students are learning to stop, look and listen. 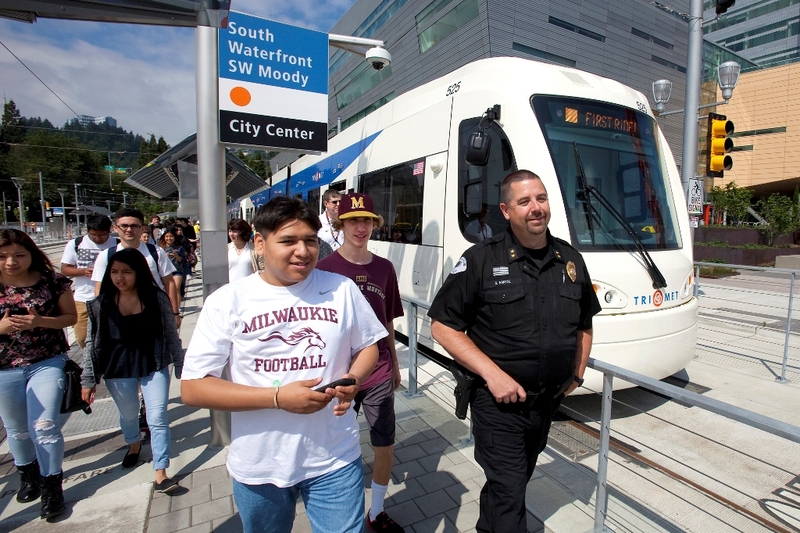 As part of the School Safety Rides program, Milwaukie Police Chief Steve Bartol and Milwaukie High students get an up close look at Tilikum Crossing, Bridge of the People. Before crossing MAX tracks, stop! Tracks mean trains so always expect a train. Milwaukie High students exit at the Milwaukie/Main St and head for the pedestrian crossing. After the first train, watch out for a second train. Trains run both directions. If you see a train coming, wait! It takes MAX trains two blocks to stop. Obey signals. Flashing lights or a lowering crossing gate means a train is approaching. It is illegal to bike, walk, skate or drive around lowered gates. Headphones, music and texting can be dangerous distractions. Stay aware and stay safe.